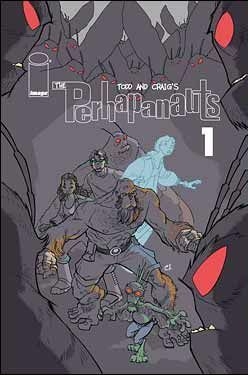 The first issue of Perhapanauts as a monthly continuing series has debuted from Image. I’m thrilled! The comic, about a group of monster fighters who are themselves weird creatures, is well-suited to the serial structure, with a cliffhanger providing plenty of suspense. Early reports have the issue selling out, which means more readers sampling and enjoying the series, I hope. The series is written by Todd Dezago and drawn by Craig Rousseau. Since this is #1, the cryptozoology characters are reintroduced in unique fashion. First, ghost Molly welcomes us in and catches us up. The team plus Karl the Mothman have been traveling through time, and Karl’s people aren’t too pleased about it. That leads to a creatively told section that’s made up of both insight and hints. Instead of giving each character an origin flashback, we get glimpses into their possible futures, which show what each dreams/fears. I love seeing Arisa’s leadership. She always seems very human, trying to figure out what’s best for her and her team, but she’s still someone who comes through in times of trouble and can always be relied upon to protect her people. She’s a real hero, but not a cardboard one, and still sympathetic. New in this series are short backup stories by different artists. In this issue, Dave Tata and Bob Almond illustrate a piece about Choopie in church. Also included are the pencils for Art Adams’ alternate cover and a pinup by Matt Wieringo featuring a giant shark. If you enjoy this, look for the Annual and the collections of the first two series. A five-page preview is available online. A complimentary copy for this review was provided by the creators, whom I’m proud to consider friends.